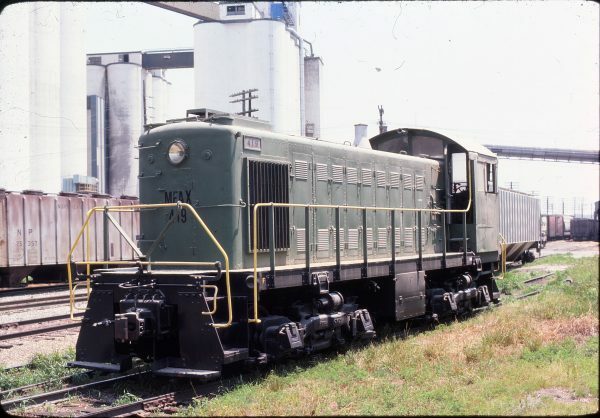 MFAX S-1 419 at Mexico, Missouri on June 16, 1979. This entry was posted in Slides and tagged 419, American Locomotive Company, MFAX, Missouri Farmers Association, S-1. Bookmark the permalink. Taken in my wife’s hometown. Looks like the photo was taken from just across the tracks from the old Alton/CB&Q passenger depot – which was still standing at last check – and near the Jefferson Street crossing where Mid-America Biofuels is currently located. View is looking to the east toward the MFA Elevator. I believe this now may be an ADM facility, but would have to verify that.